For those moments when a picture really does contain a thousand words, the Shadow Puppet iPhone, iPod Touch, and iPad app shares your photos and the stories contained in them. 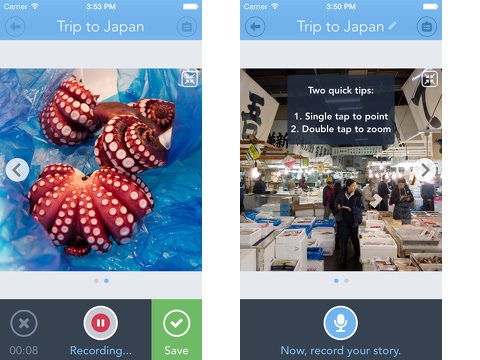 The simple, straightforward, and easily accessible navigation leads you step-by-step, as you record audio to share the words at the same time as the pictures. 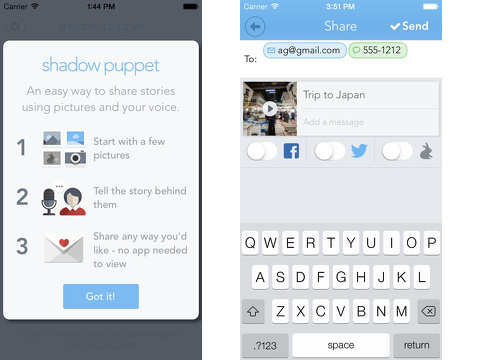 The Shadow Puppet iPhone app opens with a bright pop-up filled with the three steps necessary to create one. The concise, clear instructions are reinforced by a quick 18 second video that shows gestures. The Shadow Puppet iPhone app has a broad audience and appeal, so the careful attention to streamlining the interface and demonstrating clear directions makes it accessible to those with little tech finesse. The home screen is bright and well-organized. The top menu bar has two icons. The camera icon opens the in-app camera with one touch. The wheel icon transforms the screen to a list of settings options. The feed is a matrix of photos and title of stories. You tap the plus icon on the matrix to add your shadow puppet story. You move through the Shadow Puppet iPhone app methodically with step-by-step written instructions and clear graphic icons to aid in navigation. First, you add photos. The order of photos is determined by the timing of your touches, but you can also tap reorder to drag and drop them into your preferred order. Then, you tap the microphone icon to record your thoughts. While you speak, you can use gestures like double taps to zoom and pinches to emphasize different parts of the photo. When complete, you add a title, note, and select sharing features. The sharing interface is lovely. You can select to share on Facebook, Twitter, and Shadow Puppet social networks with a touch on the corresponding icon. You also enter an email or phone number to send a shadow puppet story as a video. It is not necessary to have the Shadow Puppet iPhone app to view your story, so you don’t have to worry about compatibility issues. The choice by the developers to incorporate the account creation phase after you create a shadow puppet story is unusual, yet sensible. You may create an account with an email or Facebook authorization. To sync with Facebook, you must authorize access to your basic profile and friends, but the Shadow Puppet iPhone app promises to refrain from posting without specific authorization. The Shadow Puppet iPhone, iPod Touch, and iPad app is effective, helpful, and shockingly simple. The free iTunes App Store download is a must-have. AppSafari review of Shadow Puppet was written by Jenni Ward on September 30th, 2013 and categorized under App Store, Free, Fun, iPad apps, Kids, Photos, Productivity, Social, Universal, Video. Page viewed 4895 times, 1 so far today. Need help on using these apps? Please read the Help Page.